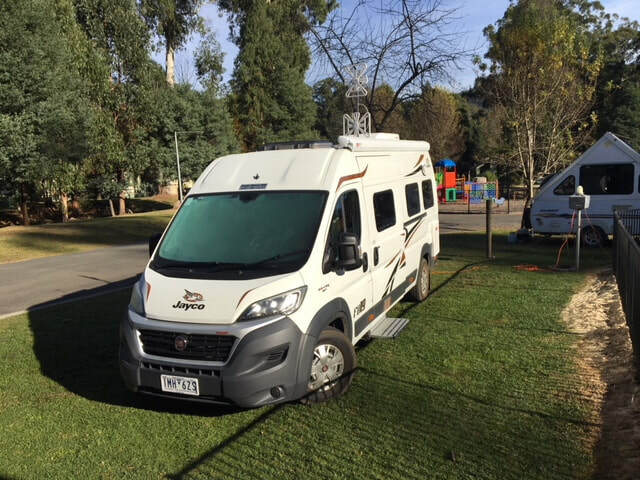 ​I bought my Jayco Conquest Motorhome / Ducato Campervan FD19 just one year ago from PageBrosRV (April 2018). I've done 13000 kms now and I like my van. I do appreciate its cleverly designed interior layout and the comfort features offered at an attractive price point (deserves 5 stars). The warranty terms and the service network is extensive, which is also a big plus. On the downside however is the significant amount of time required for workshop appointments to rectify problems during the first year of ownership. Some problems are systemic and others that are more trivial should have been detected and rectified before handover. Generally wait time for a workshop appointment is pretty long at Jayco as well as at their dealerships. Hence my appreciation to Tom, who squeezed me in today on short notice to fix a few probs while I was waiting for the van (that deserves 5 stars). The van comes with a 3 mode charge system, but the AUX/Solar Energy System is not suitable for sustained off grid camping. Furthermore the AUX/Solar charge system has some noticeable deficiencies. A system capacity upgrade is very difficult to implement due to space restraints. In this area Jayco / PageBrosRV did disappoint and I had to find a solution independently. Now that I finally did manage and have also succeeded in locating a water ingress problem I expect to be a happy camper. A huge fringe benefit for the Jayco brand are its independent self help groups, where members bounce off their problems. We hope to be able to get Jayco's ear as a group once we reach critical mass (1000+). After a few months of trouble free cruising I ultimately got bombarded by my JHub Tablet computer with "storage full" messages on my JHub tablet. In addition activating too many apps can slowly crash my tablet systems memory and hooking up to the outside world could invite viruses ! The result is at best an unstable system and at worst a total crash beyond recovery ! In addition if you use your google account to change the system setup you could unintentionally trigger syncing and cloud participation ! If you have activated any functions that require any storage then you have just increased the fault risks and if you need help far out in the bush and have to wait for an appointment once you are back near a service agent then that spoils the fun. Jayco's Campervans / Motorhomes come with standard solar power and the JHub Control and Monitoring System, a network of control modules with an Android a tablet at its centre. The Android tablet shows the performance of the JHub off grid energy system (12V) and water levels in your tanks. It's very high tech and while it looks impressive its actually too vulnerable for its purpose. But with a 2 YEAR WARRANTY for the JAYCO COMPONENT AND A 5 YEAR WARRANTY FOR THE FIAT DUCATO you get extra time to debug your system. Jayco has a huge agent network and has captured half of the Australian Market. CLICK ON MORE TO SEE PIC's OF MY UPGRADE SOLUTION ! I own a 2018 Jayco FD19 Campervan Motorhome with a 2018 JHub J35C 12V Battery Management System manufactured to Jayco specs by Setec under the BmPro Brand ! (1) - The J35's AUX current output is too low for my requirements and does not match the best in class system (Enerdrive 40A). (2) - The J35's Blended charge Algo (AUX+Solar) is in principle a good feature that would give it the edge over Enerdrive's system, but it under performs that is decides not to blend. And if you only have the Manufacturer's standard equipment installed, then you rely on every bit of charge you can get while driving in the Sunshine. The leading edge Enerdrive system is designed to be configurable to provide up to 40A from either Solar or AUX sources. So how can we improve our JHub battery charge system ? In my FD19's performance enhanced energy system outfit Setecs JHUB J35 with MiniBoost does typically charge my batteries with 15A in any of the 3 charge modes. In AC mode the system powers all loads and in addition puts 15A into the battery (batteries). In Solar mode (320W) I can now reach 20A best case, but the battery will only get the balance after all loads are supported. In Aux mode with MiniBoost I reach typically 13..15A, but the battery will only get the balance after all loads are supported. In Aux mode with original Jayco setup (with Redarc SBI bypass) I presume the output varies between 3..15A ! (B) I could have bypassed the J35 and run the Enerdrive epower straight to the Battery. That would have improved problem (1) and in case of (B) problem (2) as well. )* suitable for the FD19 and all rigs fitted with a JHub and the Redarc SBI, but without a BmPro Miniboost. Pulling the AUX connectors to the J35 at any point in the wiring loom ! (I was asked by Jayco if I ever tested this, but my answer was No, because I had installed the MiniBoost. This hack fools the Jhub into determining that Solar is the only charge source available and hence it assesses it as the dominant charge source and switches it through all the time The output current that reaches the Leisure battery will only be subject to load and Solar charge conditions. No longer will it be subject to the redundant AUX input. Jayco uses the high current Redarc SBI as their dominant AUX charge source, which makes the thinly wired AUX input to the J35 practically irrelevant. It obviously didn't do well enough on its own. Please be aware that the vastly dominant Redarc SBI borrows energy from your vehicle battery by paralleling it to the House battery for hours after charge sources have been removed. The Tablet will not show the Redarc's currents cause it doesn't know about them. DC charging power is obtained via the vehicles alternator AUX/ACC and/or the vans solar panels. For a Campervan-RV to be suitable for "self contained living off the grid" in an eco friendly manner, rapid AUX-charge and Solar-charge are vital. My expectancy for the FD19's charge system performance is that it keeps a "one way fridge" (12V) going 24/7 every day, provided I travel for 4 hours a day and/or the sun is out . This should then provide sufficient daily re-charge to have a full battery in the evening. The system should also be upgrade-able to 2 Leisure batteries and 2 Solar panels. So, how does the JHub system fare ? There are no available recommendations for owner paid solutions that bring improvements within the tight space restraints. So I may risk my warranty and its all trial and error at my end to squeeze more power into the existing space. To make things worse Setec BmPro has nothing to offer in terms of improvements of the J35, except that I install the MiniBoost and remove the Redarc smart solenoid (SBI bypass of the J35). 1 January 2019 - Happy New Year ! There are no indications yet that in 2019 Jayco will be introducing any improvements in its DC Energy systems. They where not even helpful in upgrading my 2018 FD19 system as a payed Aftermarket measure. On the JHub tablet I have occasionally observed a sudden jump from 6 or 7 bars to 10 bars when plugging into AC on arrival at destination. Proposal: Jayco / BmPro to provide a forcible reset or power-switch / isolator / actuable circuit breaker for the Leisure Battery Supply Voltage. Step1: Jayco has responded negatively to our petition for a better 12V energy system. A first step would be to change its roof layout to make room for a second solar panel. Step 2: Increase AUX charge power and improve its efficiency. Enerdrive leads the way. Step3: Provide inlet terminals for connection of a Solar blanket. There is a cigarette lighter plug at the bed. Probably not the best for 10A charging, but worth a try. This Review of the BMPRO JHUB-J35C RV-POWER MANAGEMENT SYSTEM (RV-PMS) examines its auxiliary circuit capability to charge a recreational Battery from a towing vehicles alternator. For a Campervan-RV to be suitable for self contained living including of grid camping we rely on AUX-charge, Solar-charge and possibly a generator. The minimum expectancy for a charge system is to keep a fridge going 24/7 every day while travelling for 4 hours a day. In my opinion "Self contained living" in a solar equipped van implies that a one way fridge (12V) can be maintained 24/7. That does not appear to be the case. The capability of this Battery Management System has been assessed for its ability to sustain a fridge 24/7 and provide sufficient daily re-charge the batteries from the vehicles alternator and the Solar panels. Under spec'd systems will require access to AC Mains power (the grid) every few days. The BMPRO JHUB-J35C under performs in AUX charging mode as well as in combined AUX and Solar charging mode. A Solenoid bypass installed by Jayco appears to proof my point that BmPro's JHub suffers from charge deficiencies. Further proof is that BmPro offers a Miniboost (to be paid for as an Aftermarke improvement). It is designed to boost AUX charge. But in my opinion neither the crude solenoid (battery isolator) in the BMPRO-J35 circuit, nor the Miniboost make enough of a difference. Modern vehicles have smart alternator charge system. The BMPRO Miniboost is offered as a necessary Aftermarket system supplement (not installed by the OEM Jayco). With Miniboost installed the Jhub-J35 performs reasonable at 15A (spec rates Miniboost capability at 18..20A). Jayco's original thin wiring for the J35-Aux Input appears to be sufficient to drive 15A when a Miniboost is installed. The Miniboost seems to outperform the thick wire Redarc solenoid bypass that Jayco has installed to boost the AUX charging mode. Now the weakest link is the J35's charging algo. It is capable of running a twin charge mode, but often selects only one charging source, i.e. either AUX or Solar instead of both. What can be done to solve the problem ? What I would expect is that AUX charging and Solar charging via J35 work in tandem all the time full blast until the House battery is at least 80% charged. The currently implemented charge source priority & activation algo that tests loads should only kick in when the battery is nearly fully charged (if at all). Furthermore the J35 may to often give the highly fluctuating solar charging circuit dominant source preference. With a Miniboost installed and only one solar panel available in a FD19, Solar is always the weaker source compared to AUX (15A constant vs 9A max). If we can get 15A+9A=24A most of the time, then the fridge (4A) can be sustained in a typical mixed cycle of daily driving and occasional sunshine. Considering that Jayco and Setec are in a system development partnership and that none of their Engineers are accessible to their customers is frustrating. It takes lots of emails with their respective Service departments to slowly get a picture of the systems performance. I can see no valid technical reason why the "in vehicle charge mode" for the RV house battery should not be more comparable to BMPRO's powerful AC charging modus for the grid. The JHub has been promoted as an advanced technology innovation that makes system modifications fast and easy (via Tablet). So lets hope that Australia's dominant mass manufacturer of Australian RV's (Jayco) and their System Partner (BMPRO/Setec) will be able to improve the JHUB soon to reach its full potential. In AC charge mode The JHub system bulk charges with 15A from the grid and provides additional current to power all loads. This is quite acceptable for charging one 100Ah battery, but marginal for 200..300 Ah battery blocks. The off grid J35-AUX/Solar twin charge mode in my opinion only deserves 2 stars, but the system overall due to its advanced innovative features deserves 3 stars. In AC charge mode The JHub system bulk charges with 15A from the grid and provides additional current to power all loads. This is quite acceptable for charging one 100Ah battery, but marginal for 200..300 Ah battery blocks. The off grid J35-AUX/Solar twin charge mode in my opinion only deserves 2 stars.